With over 15 years beauty experience, Lady Wax UK is a modern ladies beauty salon based in Waterloo, Liverpool. 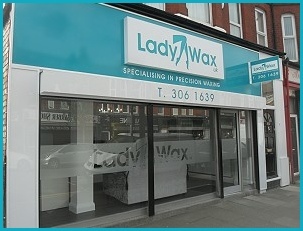 Lady Wax UK provide a one-stop shop for all of your beauty needs……You have no need to go anywhere else! Our knowledgeable and personable team will make you feel right at home and ensure you are provided with a tailored service catering for all your individual wants and needs, including specialist Lycon waxing, permanent cosmetics, threading, Nouveau Lashes, CND nails, tanning and much more. Our staff are qualified to deliver quality beauty treatments with a professional attitude. We always ensure on-going training to up-date our skills. Our prices are competitive but we do not compromise on quality or service. Come and enjoy our free complimentary cup of tea, coffee and wi-fi and enjoy the atmosphere and let us do the rest. We always keep you up to date via facebook and twitter, so join us there. Ask about our range of products and gift vouchers available to purchase. Call us to arrange an experience, not just an appointment! At Lady Wax UK we specialise in precision waxing and permanent cosmetics. We are proud to work with the best products and technology on the market to deliver superior results to our clients. Lycon wax contains the finest resins and aromatherapy oils to deliver superior performance removing hairs as short as 1mm. Our Lycon precision waxing system is the first of its kind offering a virtually pain free treatment on delicate areas with amazing results, as our pre wax oils stop our scented waxex from sticking to skin making it less uncomfortable than any other wax. Lycon is the professionals’ choice in quality wax and an essential ingredient in leading salons around the world.